Author takes readers into Jesse James’s inner circle. When Professor Gladstone receives a thesis paper about Jesse James, he believes the student, Ulysses Hercules Baxter, must have turned it in as a prank. When he calls a meeting with the consistently underwhelming student, he puts Baxter on the spot and asks him to explain the paper. With his grade on the line, Baxter must take Professor Gladstone back in time through his defense of his thesis. Wanting to change gears and write something different, author Alex Mueck crafted “Jesse James & the Secret Legend of Captain Coytus” (published by iUniverse), his new novel. “I wanted to use a historical fiction format and use comedy to knock down stereotypes,” Mueck explains. 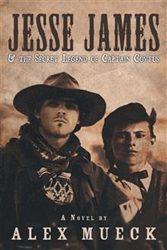 As Baxter spins his tale, readers are taken back to 1864 as Captain Coytus infiltrates Jesse James’s gang in order to avenge his father’s death. With brawn, wit and humor, Coytus fights to help the afflicted and punish the perpetrators. The story’s underlying themes center on racial and gender issues during the Civil War, and the prose uses comedy as the weapon against bigotry. Humor, a love story, and twists and turns take the reader through this fictional romp in hopes of making them laugh and teaching them a thing or two about history in the process. “It’s a historical fiction comedy that will provide plenty of laughs, but you might also shed a tear along the way,” Mueck says. Alex Mueck lives in New York with his partner-in-crime, Melissa, and their beloved pets. He is also the author of “Myth Man” and “The Account.” More information can be found at: alexmueck.com.